Tungsten crucible is the core component used in applications relating to sapphire crystal growth, vacuum evaporation and rare earth metallurgy. Tungsten crucibles are classified as either forged or pressed-sintered crucibles, depending on how they are fabricated. Spun tungsten crucible, our most commonly produced crucible, is machined from rolled tungsten plates. A high-quality plate is a critical factor to ensure the spinning process success. The spun crucible CHEMETAL USA supplies is produced by state-of-the art plate rolling and metal spinning machines. 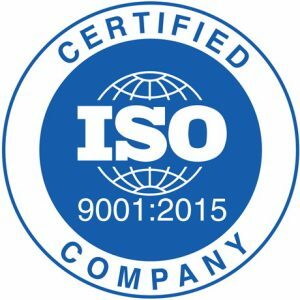 CHMETAL USA follows very strict standards in the trimming, cleaning and inspection stages. Welded tungsten crucible is fabricated by welding tungsten plates with advanced vacuum welding equipment. 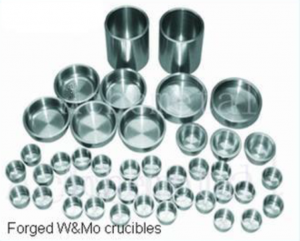 Pressed-sintered crucibles are metallized starting from high purity tungsten powders, which are initially poured in a mold and sintered by HIP (Hot Isostatic Pressing) to its final geometries. Due to our precise control at every stage, we can provide our customers a wide range of crucible sizes with accurate parameters within a short cycle time. Our tungsten crucibles feature exceptional thickness transition, smooth surface, high purity, and strong creep resistance. Tungsten crucible for sapphire crystal growth by Kyropoulos The Kyropoulos method of sapphire production uses the isostatic pressed and sintered tungsten crucible. In the Kyropoulos method, the Al2O3 powder is placed in the crucible made of tungsten and heated to its melting temperature. The crystallization occurs on the bottom of crucible. After the molten alumina solidifies, a cylindrical shaped sapphire is released out from the crucible. During this process, it is critical to insure the high purity and creep resistance of the sapphire and also make sure there are no cracks or faults on the sapphire surface. Tungsten crucible is resistant to extremely high temperatures and has a smooth surface and uniformed thickness in the wall and base. Therefore, tungsten crucible is essential to meet these requirements. Tungsten crucible for thermal sources in vacuum evaporation Tungsten crucible is a commonly used evaporation source due to its high purity, high melting point and low vapor pressure. Many factors that determine the evaporation performance are largely associated with the quality of crucible containing the evaporation materials. Here are a few examples of those factors: The evaporation rate has to be stable. The evaporant should have a very little chance of being condensed on the crucible. And also, the evaporation materials need to be prevented from splashing to the base due to uneven heating from the crucible. A well-designed tungsten crucible should be capable of solving those concerns.